When ducting the front of CellarPro VS and Split cooling units, condensation can occur in certain ambient conditions. 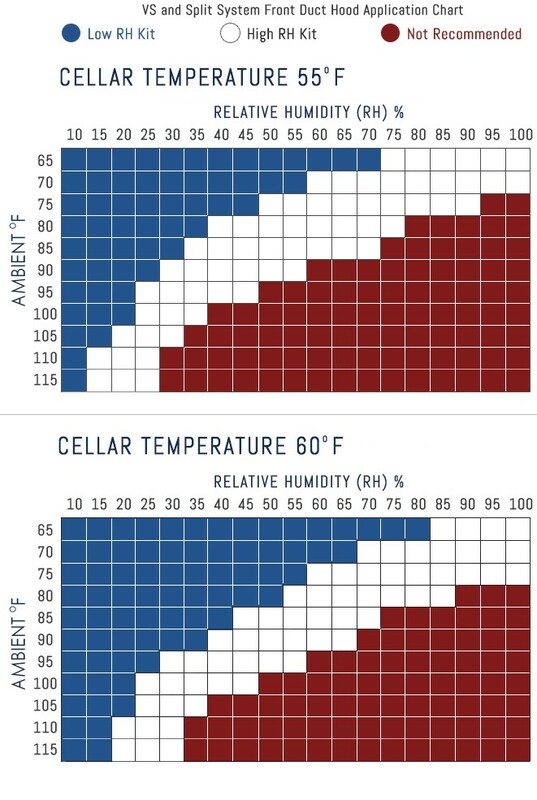 These charts provide guidance in selecting a front duct kit depending on 1) Your desired cellar temperature, 2) The ambient temperature where the cooling unit will be located, and 3) The ambient relative humidity of the location. Condensation usually occurs when the temperature of the metal on the cold surface face and front of the cooling unit drops below the ambient dew point (a function of temperature and humidity). The larger the gap in temperature between the dew point and metal temperature, the more condensation will occur. To prevent excess condensation, CellarPro has developed two front duct kits. Our High humidity conditions duct kit has extra insulation on the front and face of the cooling unit, and is designed to work in conjunction with our remote control display kit. The Low humidity condition duct kit will help in the blue areas of the chart. For areas in red, the conditions are too extreme for even our High humidity kit, and the cooling unit should be moved to a conditioned space and ducted at the rear if necessary.